This document provides an overview of how to measure in-app ecommerce related actions and impressions with the Google Analytics SDK for iOS v3. Enhanced ecommerce enables the measurement of user interactions with products across the user's shopping experience, including: product impressions, product clicks, viewing product details, adding a product to a shopping cart, initiating the checkout process, transactions, and refunds. Important: Enhanced ecommerce requires you to use enhanced ecommerce related libraries and fields that are included with the iOS SDK. Enhanced ecommerce values are sent with existing hits such as screenviews and events. You should not send transaction and item hits, which are for standard Ecommerce Tracking. Before implementing enhanced ecommerce tracking in your app, you must add the enhanced ecommerce library to your app. Impressions and selection of internal promotions. Adding / removing a product from a shopping cart. Initiating the checkout process for a product. A product must have a name or id value. All other values are optional and don't need to be set. Actions are measured by setting product values and then setting product action values to specify the action being performed. Measure a transaction by setting product values and then setting product action values to specify a purchase action. Transaction level details like total revenue, tax, and shipping are set with the product action values. By default, you can configure a common, global, currency for all transactions and items through the Google Analytics management web interface. To learn more about how currency conversion works in Google Analytics, read the Multiple Currencies section in the ecommerce feature reference. If a matching transaction is not found, the refund will not be processed. Add tracking code to measure each step of the checkout process. If applicable, add tracking code to measure checkout options. For each step in your checkout process, you’ll need to implement the corresponding tracking code to send data to Google Analytics. For each checkout step that you measure you should include a step value. This value is used to map your checkout actions to the labels you configured for each step in Ecommerce Settings. 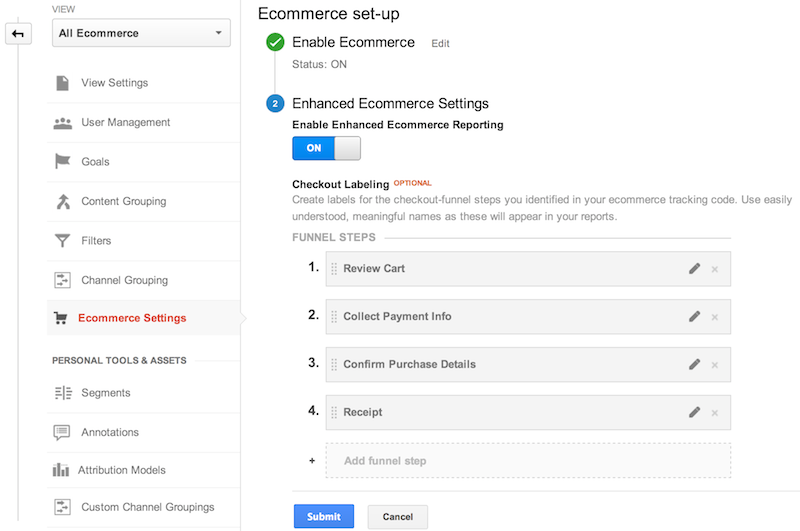 Note: If you have a single step checkout process or if you have not configured a checkout-funnel in Ecommerce Settings then the checkout step field is optional. If you have additional information about the given checkout step at the time the step is measured, you can set the checkout option field with a checkout action to capture this information. For example, the default payment type for the user (e.g. 'Visa'). To measure a checkout step, set product values and then set product action values to indicate a checkout action. If applicable you can also set a checkout step and checkout option value with the checkout. Checkout options allow you to measure additional information about the state of the checkout. This is useful in cases where you've measured a checkout step but additional information about the same checkout step is available after a user selected option has been set. For example, the user selects a shipping method. To measure a checkout option, set product action values to indicate a checkout option and include the step number, and the option description. Each step in your checkout process can be given a descriptive name that will be used in reports. To configure these names, visit the Admin section of the Google Analytics Web Interface, select the view (profile) and click on Ecommerce Settings. Follow the Ecommerce set-up instructions to label each checkout step you intend to track. Enhanced ecommerce includes support for measuring impressions and selections of internal promotions, such as banners displayed to promote a sale. Important: Although it is acceptable to set an action with a promotion impression, the action cannot be a promotion action click. If you intend to measure a promotion click action it should be done in a separate hit, after the promotion impression. Last updated April 12, 2016.